Today was one of those days that seemed like it was “go, go, go” from the moment the alarm went off. From coding out a new site, to running to the grocery store, to stacking firewood, on top of “regular” house chores, there was little time left to think about meals – let alone healthy meals. Lunch was a very quick (and kind of sad) frozen pizza. It’s times like these that I can really appreciate “fast” meals. Not to be confused with “fast food”, “fast meals” are meals that you can cook up quickly, but without all the oil, grease, and cholesterol. 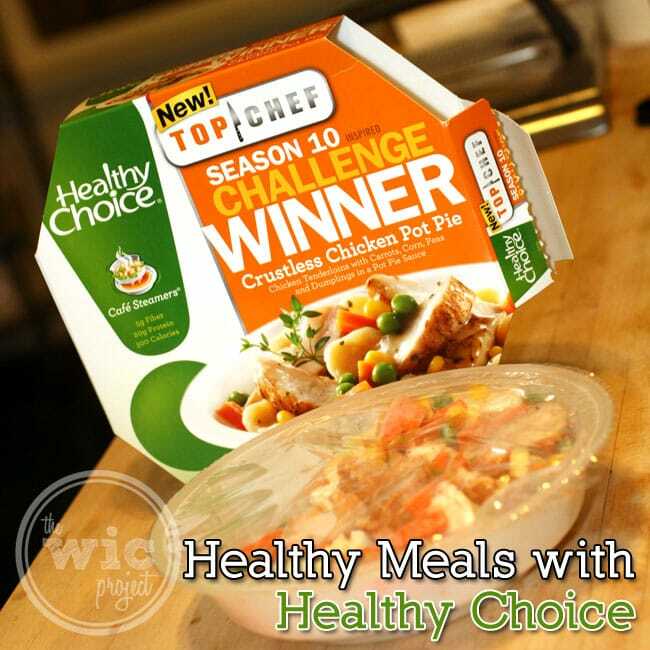 Meals like the Healthy Choice Crustless Chicken Pot Pie, or their new line of Top Chef Cafe Steamers, are the perfect options for busy lifestyles. 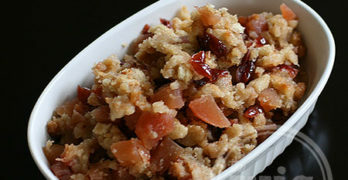 There are a variety of meals to choose from which allows you to try a lot of new flavors you might not otherwise cook. I’ve been enjoying Healthy Choice meals for over 10 years, and I was still able to find a few new Healthy Choice meals to try during a recent trip to Walmart. 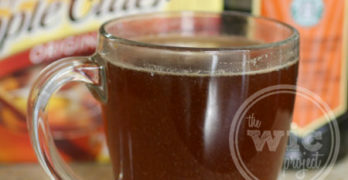 I can’t wait to try the Top Chef-inspired Chicken & Potatoes with Peach BBQ Sauce and the Healthy Choice® Café Steamers Beef Merlot Healthy Choice Top Chef Cafe Steamers. I can tell you that the Healthy Choice Crustless Chicken Pot Pie is amazing. The “steam heating” heats the entire meal up perfectly so that chicken is still tender, the dumplings are soft (but not mushy) and the veggies are still crisp. Mixed up with the sauce and it is soooo good. It’s also SOOO much better than traditional “fast food”. 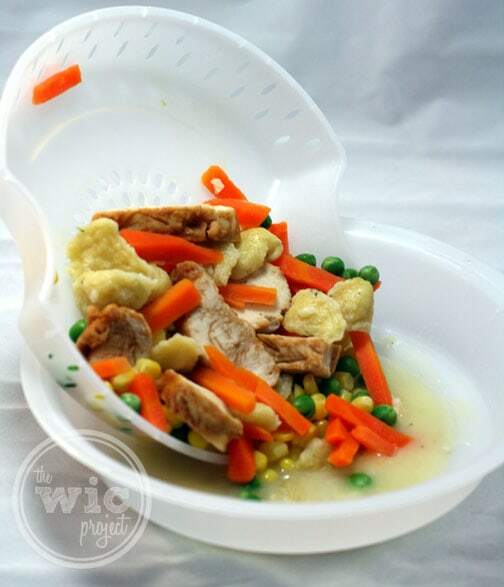 Preparing Healthy Choice Crustless Chicken Pot Pie. When you microwave it, the meal “steams” above the sauce. Mix and enjoy! Another great benefit about these Healthy Choice meals is that they are much more affordable than what you might otherwise grab when you’re on the go. I rarely leave a sandwich shop (my “healthy” version of “fast food”) for less than $5.00. The Healthy Choice meals – including the Crustless Chicken Pot Pie and Care Steamers – were just $2.50 at my local Walmart. If you use the awesome $1.00 off coupons currently in the sidebar (–>) you can drop that price to just $1.50 for a totally delicious and satisfying meal that cooks up in a matter of minutes. I know that life can get pretty hectic sometimes, but even with all the running around, you can still stay health. Here are a couple tips to stay healthy even when you’re on the go. Water keeps you hydrated and healthy. When you’re busy, sometimes you think so much about your “to-do” list that you forget to drink water. Drinking water throughout the day not only helps you stay hydrated, but also helps suppress your appetite and burn stored fat. If you know you’re going to be busy, consider preparing for your meal in advance. You can cook ahead in the days before so you can just reheat and serve when it’s time to eat. Sometimes you don’t have a meal plan, and in those cases, quick meals, like Healthy Choice meals, are a great option. You can keep them in the freezer and just microwave when you need a tasty meal in a pinch. The freezer is packed but I’ll always make room for Healthy Choice meals and Greek FroYo. If you need a little pick-me up during the day, a healthy snack can give you the boost you need. Healthy Choice Greek Frozen Yogurt is a great option. It’s like a rich ice cream, except it’s only 100 calries and is made with yogurt cultures and real fruit! I’ve tried the Strawberry and totally love it. I’m really looking forward to trying the Dark Fudge Swirl. 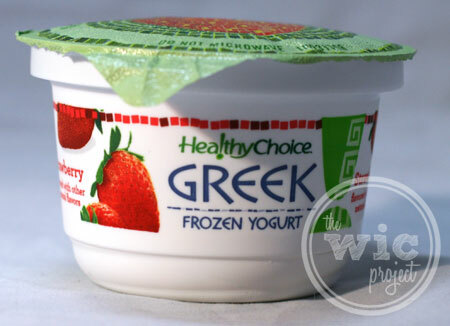 Healthy Choice Greek Frozen Yogurt made with real strawberries and yogurt cultures. Admittedly, I’ve grabbed a piece of chocolate or a handful of jelly beans to help stave off the hunger pains and it did not make me feel one bit less hungry. With a little planning (and a few meals in the freezer), you can help ensure that even when your days are hectic, or when you just don’t feel like cooking, you still have a healthy meal option you can enjoy and feel good about eating. How do you stay healthy when you’re on-the-go? Disclaimer: I am a member of the Collective Bias® Social Fabric® Community. This shop has been compensated as part of a social shopper insights study for Collective Bias® and ConAgra Foods #cbias #SocialFabric. All opinions are my own. To stay healthy when I am on the go I (gasp!) keep hemp protein bars in my purse. I say “gasp” because this really isn’t a food at all and I am trying sooooo hard to not eat processed food! To stay healthy on the go, I tend to grab some kind of fruit and have granola on hand (or a healthy granola bar) with me to stave off the hunger. I also like yogurt and whole grain crackers as a snack. I make sure to keep a water bottle with me whenever I’m out. I’ll have to check out the Healthy Choice healthy meals line of frozen meals. A more healthy alternative in those busy days is always a great choice. Great article. I have been eating the healthy choice meals for some time now and have as yet to find one that I dislike. Being diabetic, this article has given me some food for thought in ways to change my eating habits that will be much healthier for me. I like many of these quick frozen meals, but like everything else now day’s, they just keep getting smaller & smaller in size. I think having a back up plan would help me out so much! So often I start off good but then the day gets crazy and I’m just scrounging for dinner. 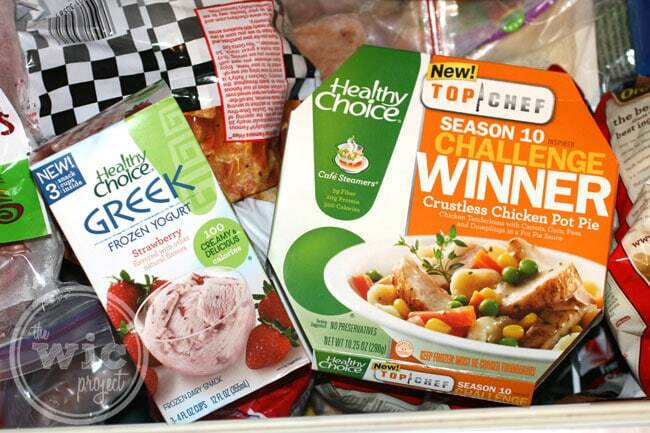 I think Healthy Choice meals would be a smart thing for me to keep in the freezer!